This post begins and ends with bad cell phone pics. Sorry. Melbourne, like most cosmopolitan cities, has a top notch public transportation system which TD and I used liberally. One of our most often-used landing points from our hotel in South Yarra was the Central Station in the city center. We must have passed through that station at least twice daily during our visit. Situated right alongside one of the many escalators was a little coffee shop selling the most outrageous looking pastries. 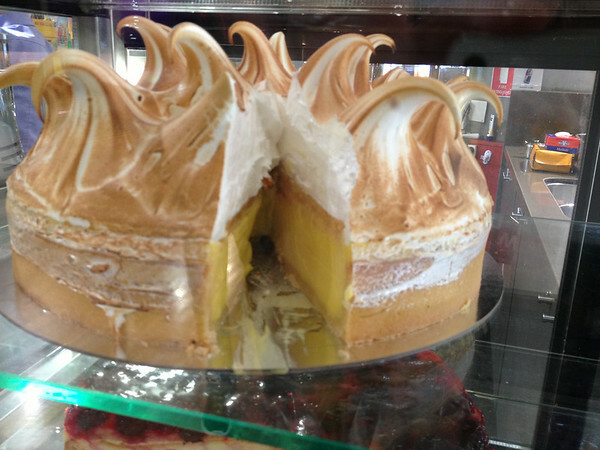 The giant lemon meringue pie immediately caught my eye on our first trip past. While timing never worked so that we were in a situation to stop and actually order a piece, I did work up the courage to snap a picture (we ordered a couple of flat whites as to not raise any eyebrows when snapping the photo). Shortly after, the idea that I could replicate this citrusy matterhorn took seed and I found myself, during our time in Australia, often thinking about how I might execute such a feat. About halfway through my research, I began to lean toward a baked-center approach. Think lemon bars. 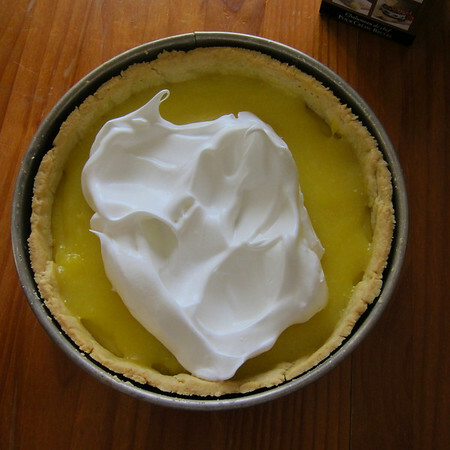 I was considering the pie more in terms of a tart than a true lemon meringue pie. But, I couldn’t quite figure out how to evenly bake the filling at about four-to-six inches of depth. 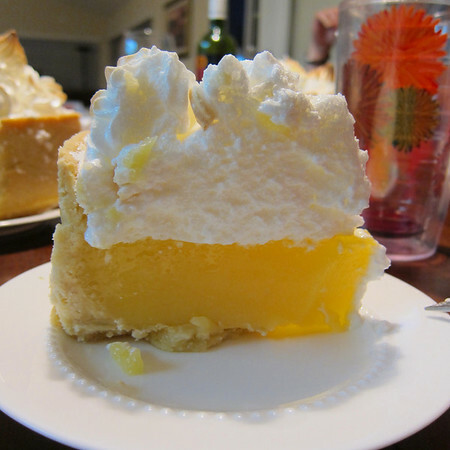 Then I happened on a post for a lemon meringue pie in the blog, Dutch Oven Diaries. They used a stovetop filling approach that looked successful. Unfortunately, the largess of the pastry also meant a two day-cooking time. Hence, the awful shots taken at night. Maybe some day I’ll learn how to take real pictures. And so, I shifted gears and experimented. I probably had a little more fun that a girl with a pastry-bag full of meringue ought to. But, the attempt was successful, at least in looks. I knew I didn’t have the right apparatus to form the same wide peaks as the pie in the metro station. So I went with quantity and height. Not one to waste an opportunity to experiment on others, I lugged the finished product to a dinner party. 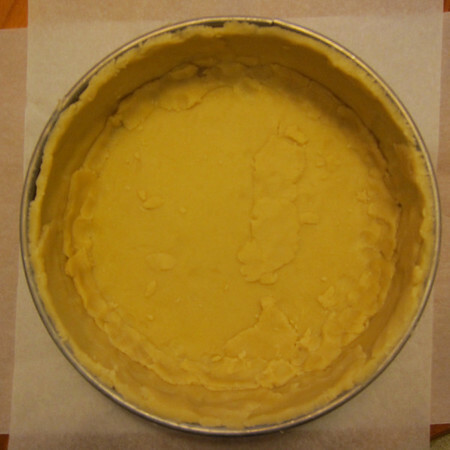 While the pie was voted a success in general, I found the filling’s texture to be a little too gelatinous. 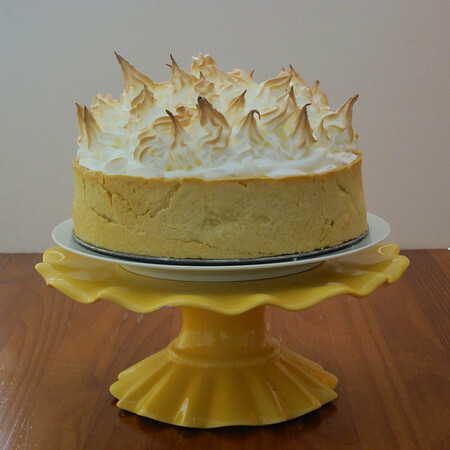 In the photo below, it also looks like I broke the meringue. I promise, it wasn’t broken when I piped it. I suspect the fact that it sat out for about 2 hours before being served might have something to do with it. As such, I consider this a work in progress and am on the hunt for an excuse to try it again. 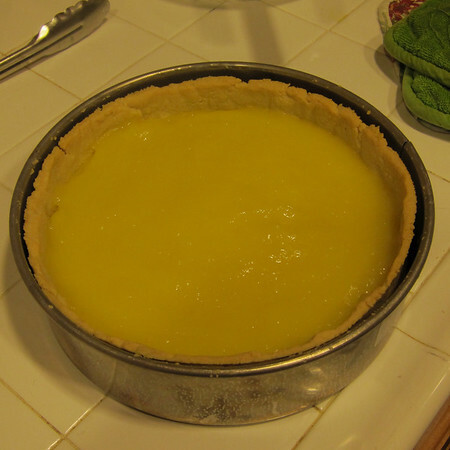 Longfellow Lemon Tart (the photos in this post are even worse than the ones in this post…small consolation). Preheat oven to 375 degrees, place rack in middle slot. Mix the egg yolk with 3 tablespoons of water and add to the flour and combine until mixture comes together, add more water if necessary. Wrap and chill in fridge for 30 minutes then roll out the pastry and line your 9 inch flan, pie or spring form pan with the dough and prick all over using a fork to prevent the crust from puffing. Line with baking paper and fill with pie weights (or dried rice or beans) and chill for another 30 minutes to prevent shrinkage. Bake for 20 minutes at then remove weights and bake for an additional 15 minutes until golden brown. Beat egg yolks with the cornstarch and slowly add some of the hot mixture to temper the yolks whisking constantly. 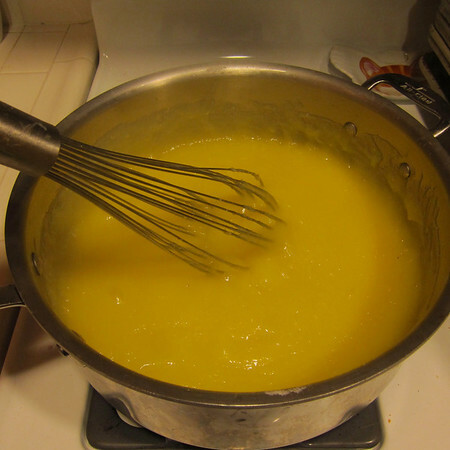 Once tempered return egg mixture to the remaining liquid and heat whisking until the mixture thickens. Pour into the baked pie crust. Whisk the egg whites until white and fluffy (until stiff peaks are formed) then whisk sugar gradually into the whites. Pile the meringue on to the now set pie, forming decorative swirls onto the filling making sure you cover right to the edges so no filling is visible. 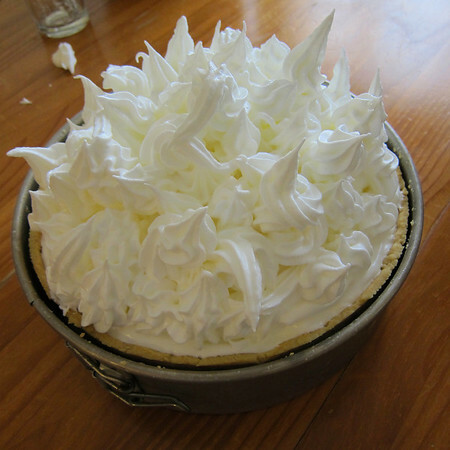 You can also pipe the very top of the meringue using desired-size tips. Store in the fridge, best if served the same day.